A unique new ply formation with two separate inner plies, two carefully glued Ayous plies - treated and glued at high temperature and at top pressure before being cooled before the next stage of production. This forms the core. These plies are surrounded by two carbon plies to give the blade stability and the necessary hardness.The purpose of these procedures is to maximise the "sweet spot". The Senso handle design has been well received for many years and valued for its precise return of the ball. This has served Dima Ovtcharov well. 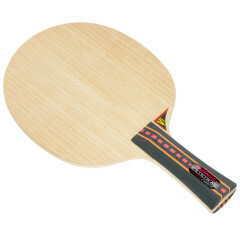 Donic Blade Ovtcharov Senso Carbon is beeing added to cart.